Purpose: In this tutorial you will learn how to set up and execute exciting calculations using the ElaStic@exciting program, which allows to obtain the full elastic tensors (elastic constants) of crystal systems for any crystal structure. In addition, the application of ElaStic@exciting to the determination of the elastic constants of C in the diamond phase and of Mg is explicitly presented. i) Preparation of the input file. The directory names /local_path_to_exciting_root and /local_tutorial_scripts_bin_directory are dummy names which must be explicitly changed by the user to the appropriate ones. ElaSticSCRIPTS.tar.gz: All the scripts for performing elastic-constant calculations. Requirements: Bash shell. 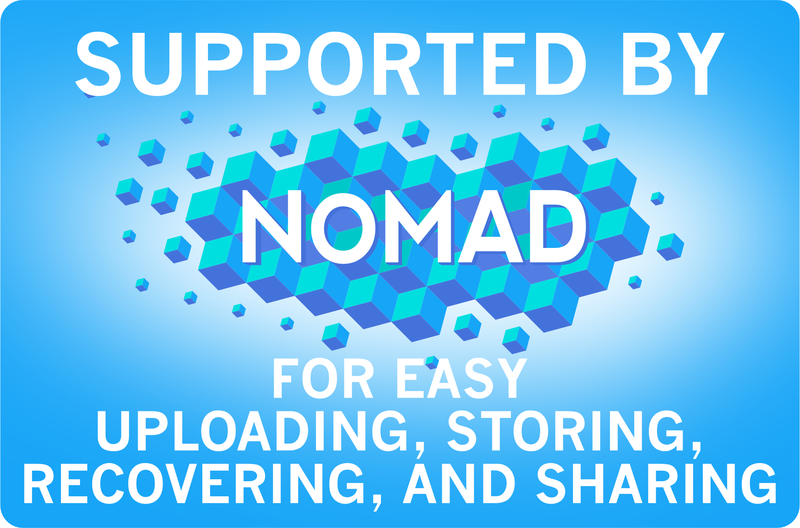 Python numpy, lxml, os, and sys libraries. xmgrace (visualization tool). ATTENTION: sgroup program has been installed in your computer simply go to the next step. CONGRATULATION: At this point, you have everything that you need for starting and performing an elastic-constants calculation. The second-order elastic constants (SOEC) can be represented, in the Voigt notation, as a 6x6 matrix. Since this matrix is symmetric, the maximum number of independent Cij is 21. For a given crystal symmetry, some of these 21 elastic constants may be equal, vanish, or be simply related to other Ckl. Therefore, the actual number of independent elastic constants depends on the symmetry of the crystal structure. In the following table, we show the 9 different groups of SOEC, classified by the space group number. In order to calculate the SOEC, the number of independent distortions that one should consider is equal to the number of independent elastic constants. For instance, for cubic structures like diamond we need only 3 independent distorsions, for hexagonal crystals 5, and so on. In this tutorial, we will consider two examples: First, Carbon in the diamond structure, which belongs to the group in the first row in the table (see also the tutorial Energy vs. Strain Calculations). Second, Magnesium in the hexagonal structure. 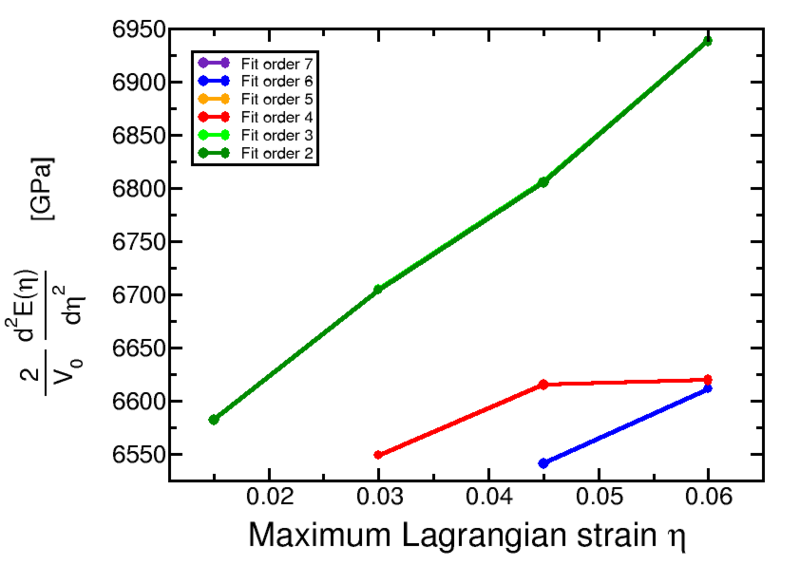 All the strains considered in this tutorial are Lagrangian strains. In this example, the (on screen) input entries are preceded by the symbol »». The entry values must be typed on the screen when requested. The first entry (in our example 0.060) represents the absolute value of the maximum strain for which we want to perform the calculation. 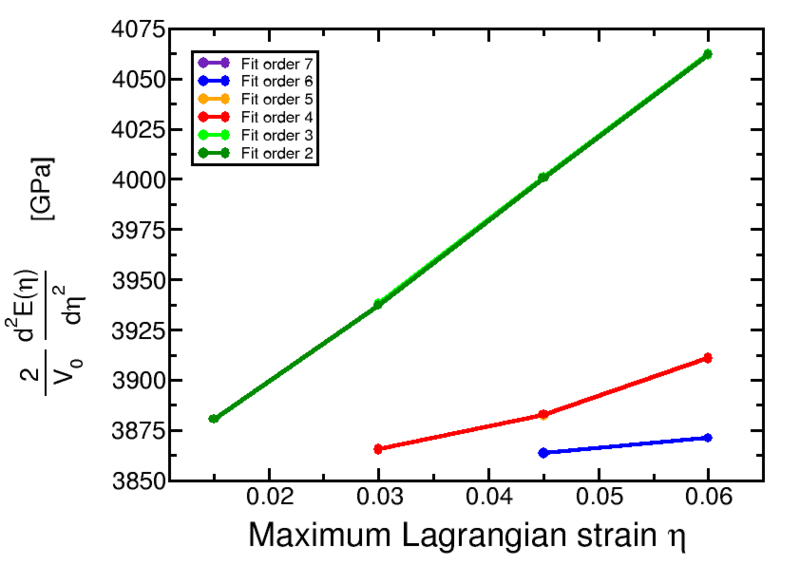 The second entry (9) is the number of deformed structures equally spaced in strain, which are generated between the maximum negative strain and the maximum positive one. After the complete run, the elastic constants can be calculated. ATTENTION:The computation time necessary for running exciting_ElaStic for the complete calculation of the elastic constants of diamond, is of the order of hour. In order to save time, you could alternatively download here a tar archive with the relevant output files (INFO.OUT and TOTENERGY.OUT for all distorsions). The main output files of the script exciting_ElaStic_Result.py are ElaStic_2nd.out, ElaStic_4th.out, and ElaStic_6th.out. 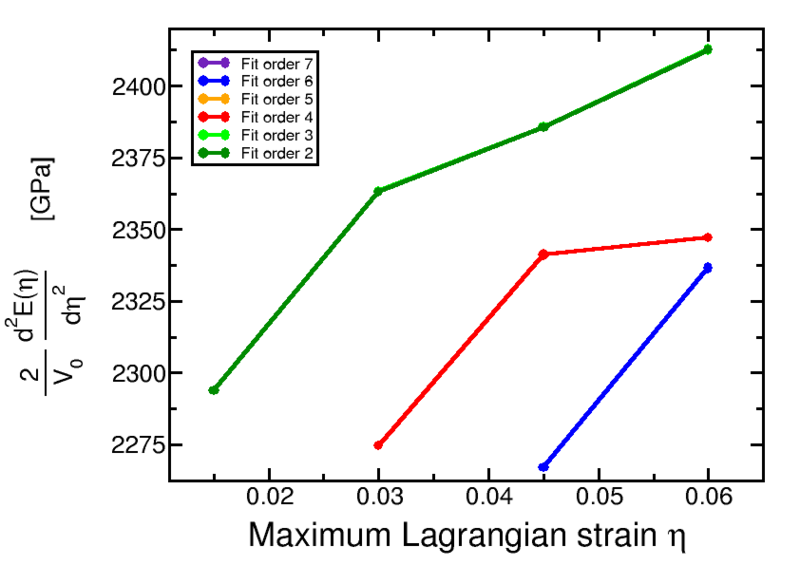 These file contains the results for the elastic constants, the different numbers refers to the different order of the polynomial used in the fit (see the tutorial Energy vs. Strain Calculations for more details on the fitting procedure). the maximum degree of the polynomial used in the fitting procedure(different colors in xmgrace plots). As an example, we analize the first plot, corresponding to the distorsion Dst01. The distortion types are listed in the file Distorted_Parameter. By examinating this file, we can see that the Dst01 distorsion corresponds to an applied Lagrangian strain in Voigt notation with the form (η,η,η,0,0,0), where η is a strain parameter. This deformation type is directly connected with the bulk module B0. By analyzing the first plot, we notice that the curves corresponding to the higher order of the polynomial used in the fit shows a horizontal plateau at about 3870-3880 GPa. This can be assumed to be the converged value for the second derivative, from the point of view of the fit. For this distorsion type, this value equals 9 times the bulk modulus. Thus, the extracted value of the bulk modulus is 430-431 GPa. In the next example, we consider the calculation of the elastic constants of hexagonal Mg. The computation time necessary for running exciting_ElaStic for the complete calculation of the elastic constants of Mg, is of the order of several hours. In order to save time, you could alternatively download here a tar archive with the relevant output files (INFO.OUT and TOTENERGY.OUT for all distorsions).